I was pretty happy with my Bloody Rustic Lantern from Spirit Halloween last year ($15), but I wished it wasn’t covered in blood spatter. So this year when I found two different ones online with no blood, I ordered them. One has the same incandescent bulb as the Spirit Halloween one, the other is sound activated with a flickering LED flame and spooky sounds. 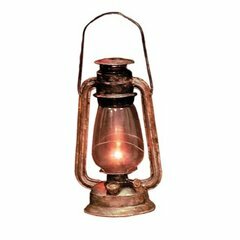 Old Lantern (Battery Operated) Item 138511 or N0173 by Seasons USA Inc. Haunted Lantern – Battery Operated w/Sound Item 181774 or 19668 by Seasons USA Inc. Here are all three lit up to compare their brightness. And here is what I thought the Old Lantern looked like. If anyone finds one with the longer glass like this, let me know. I like the style. I don’t really like products with sound because they are usually stupid, but in that case I just disconnect the speaker. The Haunted Lantern is mostly screams, wind, thunder, and what might be crackling noise from a wood burning fire (which is incorrect for a lantern). Not sure if I will disable the sound on this one or not. The flame and sound are motion activated and it is dim compared to the other lanterns so it may go unnoticed without the sound. I use my stuff outdoors and its dark so motion sensors rarely work for me. Not sure what I am going to do about that. Luckily it comes with a try me button that I might be able to extend the cable and trigger it manually. I would not recommend the one with sound unless you are using it in an area with enough light to set off a motion sensor and you like stuff with sound. Other than the blood spatter, I like the paint job on the Spirit Halloween one, but all three are very similarly antiqued and the difference could be all up to who slaps the paint on during production. All three open just like a real oil lantern would, but the LED bulb is glued in place. 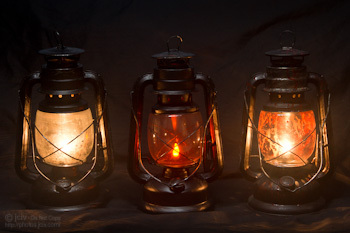 On the two non LED lanterns, you can change the bulb if it burns out by opening it as if you were cleaning a real oil lantern. For my needs, the plain cheap one is the best at only $9 from Halloween24.com. These antique style Halloween lanterns appear very similar to the Deitz #76 Original Cold Blast Lantern. Though its slightly smaller, you can buy the real oil burning one for $17 in red, blue, or green. Of course, for safety purposes a battery powered one is much prefered for Halloween. Deitz makes some of those too, an LED lantern in the same style for $25 in black and a more powerful LED latnern with almost as much candle power as the real oil lantern of that style. For our recent possible hurricane, I bought a Lamplight Emergency Lighting Kit with a very similar looking (non-Deitz) lantern for around $17 which is much brighter than a Halloween decoration. It is the reason I decided to start looking for lanterns to add to my yard haunt this year.